Obverse Effigy of Queen Elizabeth II and the words "Elizabeth II D.G. 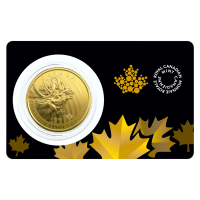 Regina 2019 200 Dollars"
Reverse Head Portrait of a Moose. Effigy of Queen Elizabeth II and the words "Elizabeth II D.G. Regina 2019 200 Dollars"
Head Portrait of a Moose.